Fancy a spot of local plonk; the stuff that puts a spring into your step and six points off you driving licence? Well, you’ll be in luck on the 8th in Almuñécar. 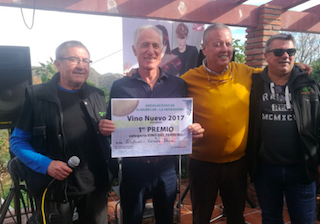 Yes, the tiny hamlet, Los Martínez, somewhere up Río Verde, will be holding its 20th wine-tasting competition, entitled Vino Nuevo 2018 during the morning of Saturday the 8th. Basically, it works like this: you turn up, wait until the judges have decided who has won, then sidle up with empty plastic cup and wait for it to flow! There will also be a BBQ with plenty of typical yokel grub, such as chorizo, morcilla and plenty of bread.to wrap it in. The wine’s usually free but the food isn’t, but it is cheap. Right, so it all kicks off at 11.00h with those that are going to enter their lovingly created nectar (five litres) and their names. The grapes must have been grown in the area; Ríos Verde, Seco and Jate and must have been trod in the traditional manner by the competitor or a family member. Not sure how they can enforce that unless you have to brandish blue-stained feet, but never mind. At 12.00h the judging begins and by 13.00h their decisions will be made public; i.e., “hick” or “I’m going to lie down and nod off – wake me when the foods ready.” Nah! The winner will be announced and the prizes as well as diplomas for all the participants will be handed over. Then it’s grub and a little bit of country-style dancing in the form of Fandango Cortijero… and no doubt a bit of vomiting, a frisky punch up or two and declarations of eternal love to total strangers. This entry was posted on Tuesday, December 4th, 2018 at 1:22 am	and is filed under Almuñécar. You can follow any responses to this entry through the RSS 2.0 feed.